Let’s Paint an Easy Winter Landscape Free Step by Step Watercolor – Let's Paint Nature! This is Let’s Paint Nature’s 500th post! To celebrate, let’s post a free step by step watercolor demonstration!!! And let it be an easy on at that. Here we go…. Step 1: With a pencil, draw a simple sketch. The horizon is 1/3rd of the way down from the top of the paper. To simplify, the background trees will be grouped together as a lump. 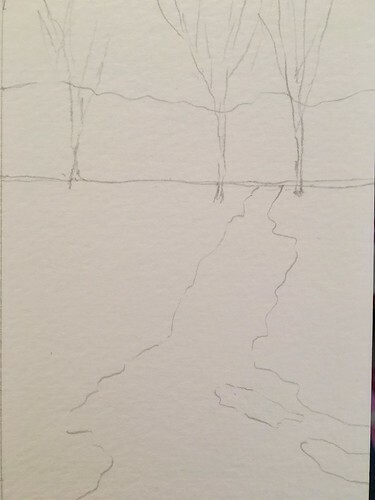 Next we will only sketch 3 individual trees instead of all the ones we see in the photo. 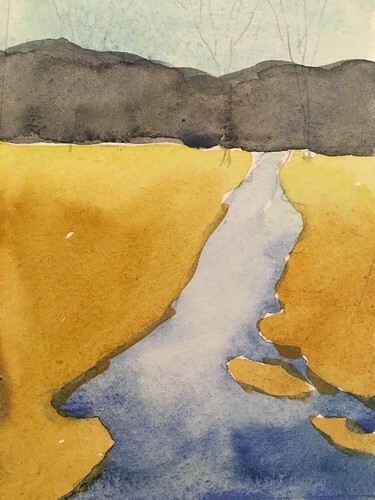 The stream is skinny at the horizon line but broad and wide at the bottom of the paper. 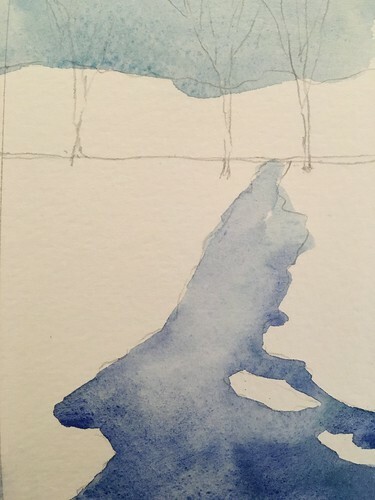 Step 2: Using cerulean blue, paint the sky and the stream. While the stream is wet, touch the bottom of the stream with cobalt blue. Let the colors blend by themselves. Don’t keep brushing. 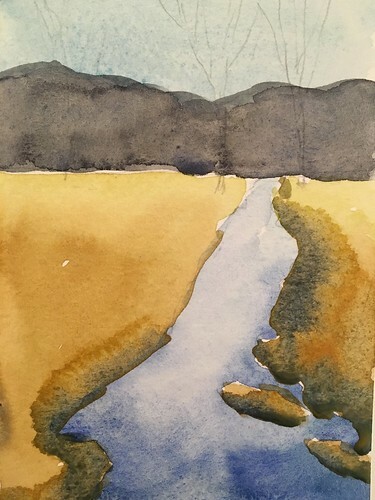 Just drop the cobalt blue by touching the bottom half of the stream and let the blending take care of itself. Step 3: For the background trees, mix sepia and cobalt blue. Paint one big solid chunk of color. Let dry completely. Step 4: We will paint the grasses. In winter when there is no snow, the grasses take on a beautiful golden amber color. For this step, paint the grass closes to the horizon yellow ocher and lime green. While wet, continue down with pure yellow ocher. 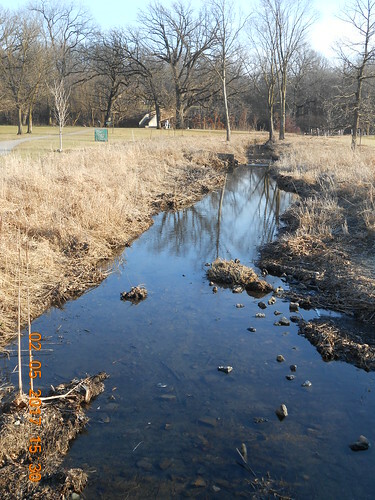 Step 5: While the grass area is wet, touch the sides closest to the stream with a mix of yellow ocher and cobalt blue. Let it do its job and blend into the grasses. This effect represents a bit of shadow. 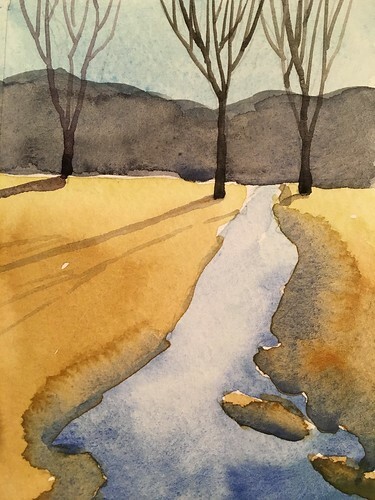 Step 6: The two trees on either side of the stream was painted with a thin rigger brush and sepia watercolor paint. The left tree was painted with a mixture of sepia and violet. Don’t over stress about these trees. Start from the bottom, the large trunk, then work your way up with thin branches. Step 7: Using a weak mixture of cobalt blue and water, paint the tree shadows streaking across the grass. 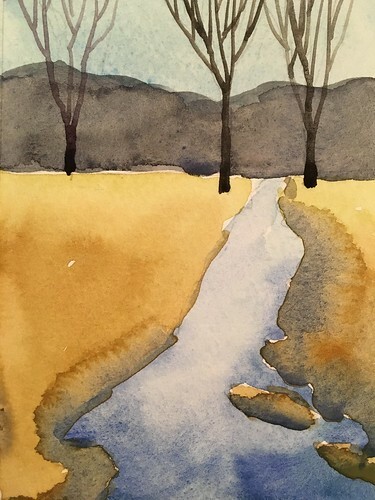 I also used cobalt blue to make thin horizontal lines in the stream. This helps the viewer understand that this is water and not frozen ice or land. Step 9 Final: In this step, using your fine rigger brush, paint some grasses only on the bottom of the painting using yellow ocher. When that is dry, paint grasses using sepia. 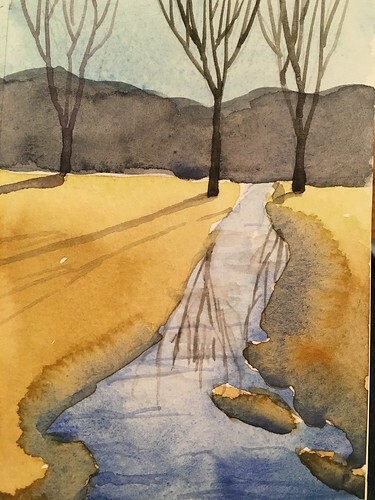 Take that same sepia color and paint a line where the grass touches the stream to define a separation. 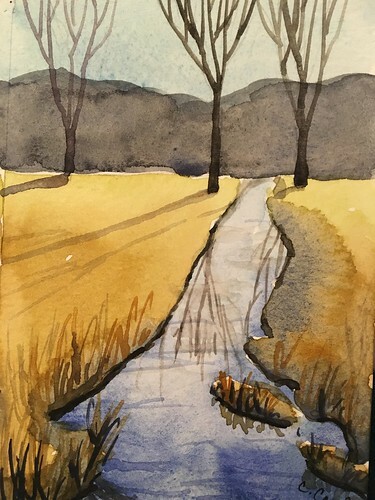 Next, paint some reflective grasses in the water, only on the bottom of the paper. Why? Because we only want to define a little bit of detail closest to the viewer and not the whole painting. If we detailed the whole painting it would be too much for a quick watercolor sketch. There are some things we just need to eliminate to reach our goal. Our goal is quick and simple. And I think we reached our goal with this one! 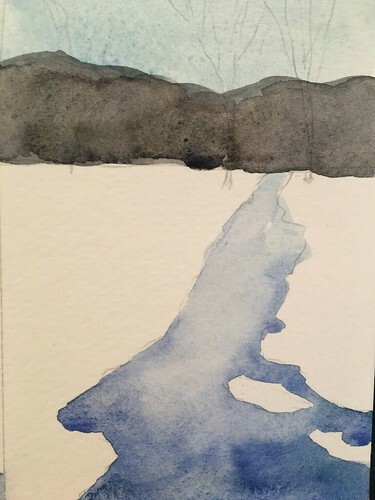 I hope you enjoyed this free step by step sketch of an easy watercolor winter landscape! What an excellent tutorial. What I love best is how you allowed the colors of the field bleed along the waters edge to form the stream bank. That takes a great deal of practice and control. In my case, it would’ve been a wonderful mistake.